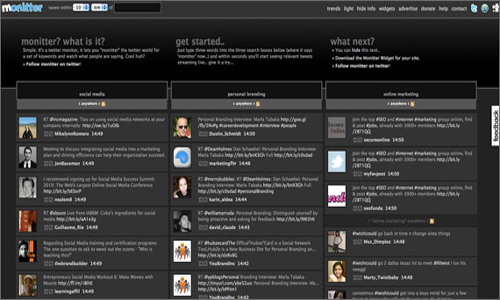 6Monniter is a free real-time Twitter search and monitoring tool. It allows you to narrow your search by geolocation, to set up multiple queries and to see them side by side. Plus, you can pause the monitoring of each column. Saved searches aren’t part of its options since you don’t have to sign up to use it. You can, however, place a keyword-tracking widget on your website. 7SocialOomph will monitor the tweet stream for you and periodically email you a list of messages containing your specified keywords. You get a limited number of keywords with the free version, but it’s more than most other free tools allow. The professional version costs $27.97 per month. Socialbrite uses SocialOomph to auto-follow new followers — despite its awful interface. 8SproutSocial is an elegantly-designed social media dashboard which also allows for keyword tracking. You can aggregate your searches into one data stream to streamline your searches. It also helps you manage Facebook, Twitter, LinkedIn, Foursquare and other networks. The Pro version is $9 a month, while the Business version is $49 a month. Only the Pro version gives you the option to narrow keyword searches by location. They do, however, offer a 50 percent discount for nonprofits. Email [email protected] to request your discount. 9Tweetbeep lets you track conversations with hourly updates or daily emails. To use this service, you have to sign up and confirm by email. It will also track mentions of your website, even if tweets use a URL shortening service. You can set up 10 keyword alerts for free or upgrade to the Premium version for $20 a month, and get up to 200 alerts with a 15-minute alert option. 10TweetAlarm allows you to track as many keywords as you like and gives you notices whenever you want — daily, weekly or as often as they find tweets that match your query. You can also ignore tweets from users of your choice, including from your own account. • 10 great get-down-to-business Twitter apps for nonprofitsLindsay Oberst is a freelance writer who writes about art, culture and topics that relate to social and environmental good. Follow her on Twitter at @LindsayOSocial for social good discussions or at @LindsayOWrite to chat about writing. where can i go to learn more about twitter “lists”…. i really dont understand them and keep reading how useful they can be… Thank you. Thanks for your comment. Our sharing center has more articles about using Twitter lists. Here’s a video tutorial to get you started, which includes links to other relevant articles around the web on the topic of lists. Thank you for including PeopleBrowsr and Kred in your list of the best twitter monitoring tools. We are very excited to offer the best in social media management with our comprehensive Playground platform and Kred, the first completely transparent influence measure. For more information visit PeopleBrowsr.com or ask us directly @peoplebrowsr @kred. Need help to set up Social Media Marketing campaign for a Non-Profit Charity for Veterans and Seniors.